Great view out back of pub. Room was very good and roomy. Host was a lovely lady who work hard to make your stay great. Good bar with a few interesting locals to chat to. A very quaint quiet little place. it wasn't like you was staying any where but your own place as very private. quick checking in & out. Very reasonable and comfortable, we will be booking again soon. Property is an old stone building on the main road through a village in the hills. Part of the building is a pub but we didn't hear any noise from that. Nice to have a separate bedroom, bathroom and kitchen / sitting room. Liked being able to cook own dinner and use fridge to store milk for breakfast. Would be suitable for a stay of several days as plenty of room for two people. Our apartment was up some stairs, but there were also ground floor apartments available. Apartment was clean. Mattress was firm. There are heaters in bedroom, bathroom and sitting room. Vehicles can be parked in the pub car park. Didn't use the free wi-fi but phone's wi-fi was fine. Apartment with 3 separate rooms, lounge/kitchen, bedroom & bathroom. Very quiet area. Although the pub itself doesn't do food there are several eateries in the nearby village. Warm, cosy, peaceful, comfy bed and lovely shower. Lovely lady. Lovely views from the room. Good area. Excellent location and accommodation, friendly staff in the pub. I would highly recommend this place. It is a self catering apartment and we brought our own food. The bed was good it was nice and quiet. There was parking on site and in the evening the bar was open and the customers/land lady very welcoming. Amazing value for money!! Lovely and cosy and absolutely gorgeous. Based on such a beautiful location and Lorna is absolutely lovely! She goes above and beyond for all her guests would highly recommend! Lock in a great price for The Butchers Arms – rated 8.7 by recent guests! The Butchers Arms This rating is a reflection of how the property compares to the industry standard when it comes to price, facilities and services available. It's based on a self-evaluation by the property. Use this rating to help choose your stay! 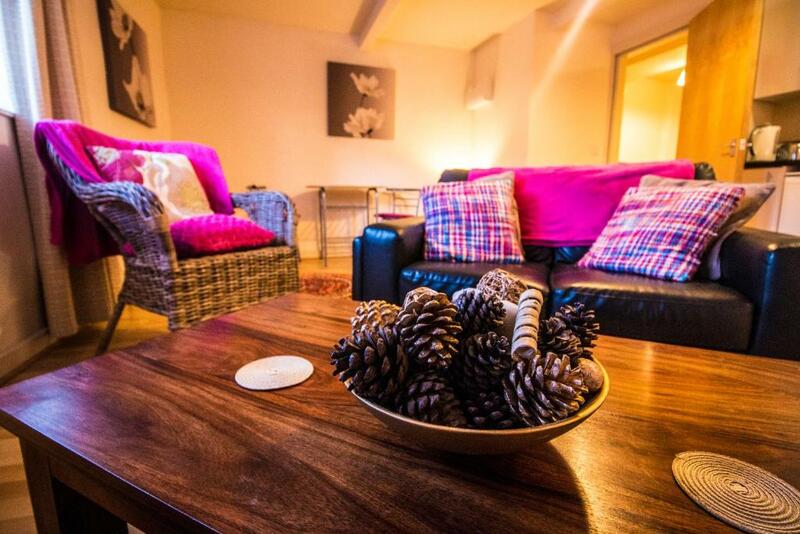 Located in the quiet village of Ripponden, The Butchers Arms self-catering apartments are surrounded by countryside walks. Adjoining the village pub, guests have access to a bar, a lounge area, free Wi-Fi access in public areas and free on-site parking. With their own private entrance, the apartments at The Butchers Arms each include a fully-equipped kitchen, a flat-screen TV, an private bathroom, a sitting area with a sofa. From the apartments, the Peak District National Park is less than 11 miles away. Close to a number of cities and towns, the nearest city is Bradford, just 34 minutes’ drive away. Popular with tourists in the area, Eureka! The National Children’s Museum is 7 miles away. Halifax Bradley Hall Golf Club is also just 6 miles away. When would you like to stay at The Butchers Arms? This apartment includes a fully-equipped kitchen, a flat-screen TV, an private bathroom, a sitting area with a sofa. This apartment has kitchenware and a seating area. Old listed building dating back hundreds of years, set just on the outskirts of Ripponden village. There's a small area to the rear with a picnic bench and smoking area. Large free car park, with night time security cameras. We are just a short ride from Jn22 of the M62, excellent for commuting to Manchester or Leeds. We don't allow smoking inside the rooms, and there is a fine for obvious smoke left in the rooms. Dogs are allowed, but a small fee is added as a one off charge for extra cleaning involved. This charge is one time only, if you stay one day or one week. Hello my name is Lorna, I have been here since 1990. I run everything myself, if there's anything at all you need please do let me know, and I will be sure to help. The Butchers Arms dates back hundreds of years, and used to be 4 cottages a long time ago. We used to run a much larger pub, restaurant with a games room for pool, and were famous for our roast beef dinners. Though after almost 20 years we decided to convert such a large area into apartments, and leave the bar area smaller just for the locals, with drinks only. Six apartments were made, we keep to an immaculate standard, I hand clean every single room myself top to bottom. It is very friendly and cozy at the bar if you wish to pop in for a drink and some company, or unobstrusive if not. The bar it's self is quiet so no need to worry about loud noise or music while staying in our apartments. The village of Ripponden offers wide range of high quality restaurants and bars,take outs or co op to buy your own food and drink. This is in the mist of beautiful country side. There is a golf course, horse riding, walking, and fishing all here. It is truly stunning. There is also 2 reservoirs in walking distance to walk round where if you are lucky you might spot a wild deer. It is just a hopp away from the M62 Jn22. We also had the Tour de France pass the door so it is great for cyclists. House Rules The Butchers Arms takes special requests – add in the next step! All children under 12 years are charged GBP 5 per night for extra beds. Any additional older children or adults are charged GBP 8 per night for extra beds. The Butchers Arms accepts these cards and reserves the right to temporarily hold an amount prior to arrival. Smoking is not permitted in the apartments. Guests found violating this rule will be charged a GBP 20 fine. Please inform The Butchers Arms of your expected arrival time in advance. You can use the Special Requests box when booking, or contact the property directly using the contact details in your confirmation. Small TV that didn't have all the channels. No WiFi, or at least none that I was told about or could find. The tv was very small in the lounge. The heating wasn’t working properly but the lady did get us an extra radiator to plug in on our last night. We accidentally turned the water switch off to which we had to wait till the evening to take a shower. Freezing bathroom - could do with a little heater in there. Weather could have been warmer but it was New Year. The only thing that drops the points is the temperature of the main room. I fully understand that there are limits to what can be done in a grade II listed building, my suggestion would be to have a second plug in heater in the winter months. A fantastic space that met my needs, very simple to check in/out. Private and self-contained yet host was in reach should I have needed anything. For the price and the location, superb little apartment. We had a fab stay with the dog. Will definitely come back! Great little apartment, with just about everything you could need for a stay away from home. Nice touch of tea, coffee & whitener so you can have a cuppa when you arrive, even if you havent been shopping. Lorna was very helpful and friendly, giving advise on the local area. The host was friendly and quick in checking me in and showing me around! Clean place and perfect location for what I needed.